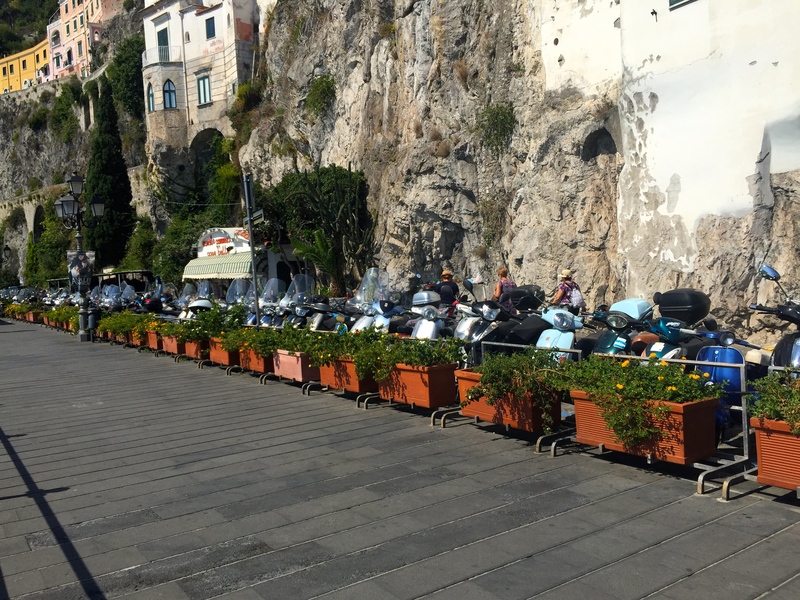 Ramblings on Italy The Amalfi Coast Sorrento 2015. Journey to sorrento 6.45 very busy. In a merc people carrier. 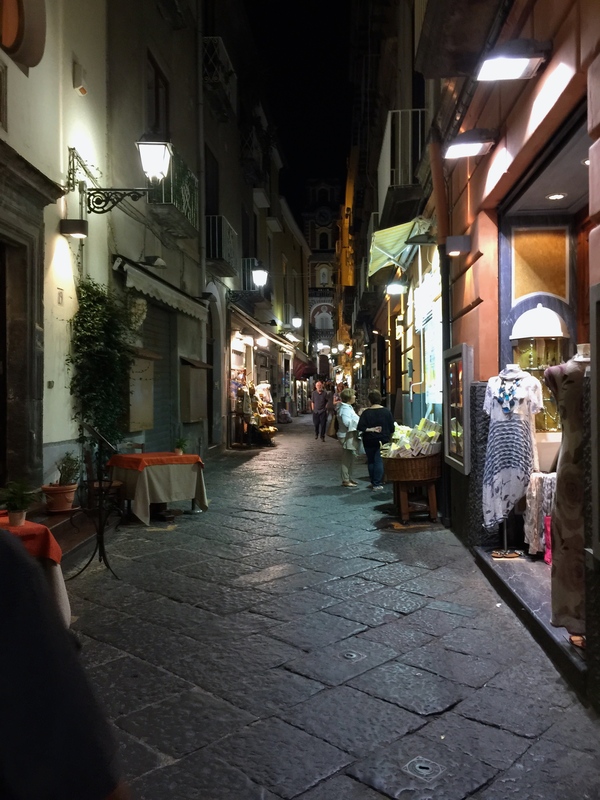 Naples looked a dump. Many long tunnels through mountains with long queues and fumes! Saw Versuvius pouting suphurous fumes out of various vents. Rather misty out to sea. The scooters and bikes make suicidal manouvers. The road wound through the mountains this way and that-huge vertical drops to the side. Darkness fell and there appeared pinpricks of lights up mountainside and down valleys. The traffics horrendous but the drivers seem quite laid back and easy going. Off the main road through little tree lined narrow strrets. Hundreds of scooters I reckon 99% of population have scooters. A brilliant form of transport. You can carry your child dog shopping or granny in front of you in the well! If the weather wasnt so unpredictable in britain It would help traffic flow around our towns and cities and cut traffic jams. Although in uptight safety conscious UK we wouldnt be able to drive them on the wrong side of the road,over double white lines, down one way streets without your helmet fastened or heaven forbid in shorts and t shirts without a helmet altogether! The whole thing about the traffic in southern italy is that its so laid back and calm. I only saw one altercation in a week. Nobody shouts swears name calls or does rude signs! 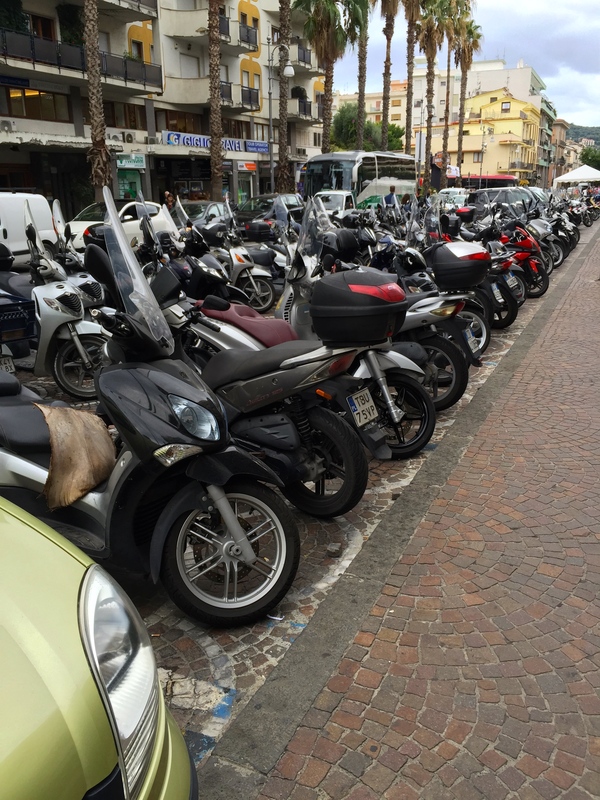 There are many cars with scraps and bumps though and sorrento is very busy during the day. One of the things I resolve to be when I get home, is more calm and relaxed when driving. 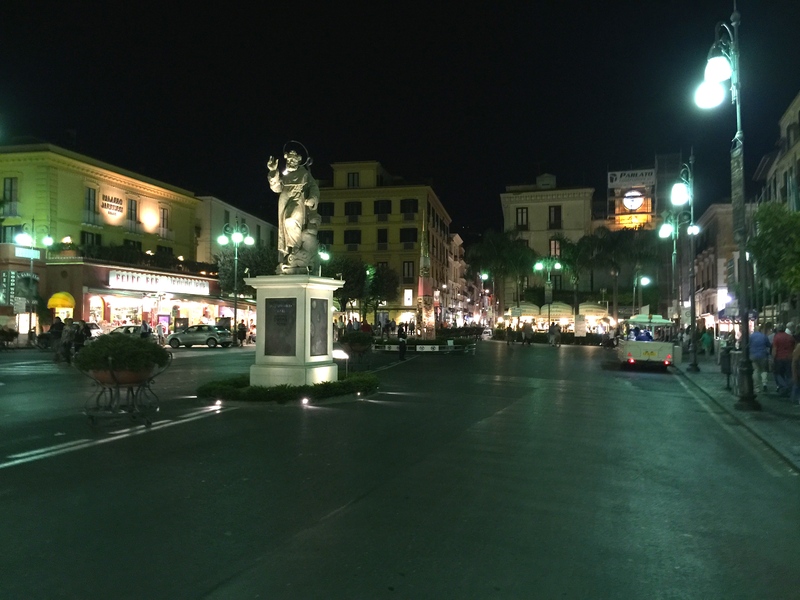 In Sorrento, the traffic stops in the centre at night, everybody comes out to eat, meet, walk and chat. Children are out playing around the trees whilst adults sit drinking and talking. I didnt see anybody drunk lurching about the strrets shouting bawling or singing football chants which is apt to happen most weekends in leeds. 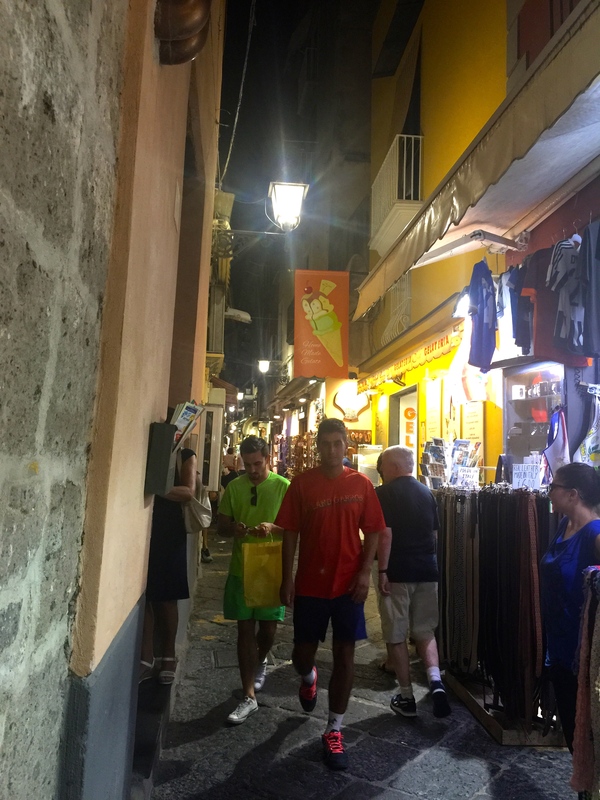 The streets here are very clean but Naples is different altogether. The outside of buildings look tatty with plaster falling off. The schools start early and finish about 1pm, when the all surge out of school all in their own brightly coloured clothes. I reallly dont get the British and their pathetic insistance on school uniform and the ridiculous instances of children being sent home for,god fobid, show an ounce of originality or i dependance of style! Absolutely bloody stupid and ignorant! Clothes maketh not the man ( or woman). I think the Italians must laugh at some of the rules we British think raise standards! The Italians here love their dogs too! Another tick for them. Dogs are allowed anywhere. Shops, restaurants, cafes, trains, buses and shops. Many dogs are taken to work and lay quite happily oblivious to traffic, human and mechanical. They enjoy riding on scooters too. Cats too are all around the streets and ports – all seem well cared for and content even if some may be feral. However i did spy a couple of tame crows in a tiny cage! Not good for any animal let alone such intelligent ones. One other negative is smoking! It is allowed evrywhere and anywhere which is extremely unpleasant if you happen to be in a restaurant having a meal next to someone smoking, particularly as the tables are all very close. I remember when it was allowed in England . It was particularly bad in pubs and used to make my eyes sting. That’s a plus for my homeland. The majority of the inhabitants of Sorrento live in high rise apartments, with a small balcony. They’re in very close proximity and have no garden. In fact there appear to be no parks just plazas with cafes and a bit of grass oh and palm trees I suppose it’s due to lack of space. I couldn’t be doing without my garden. Theres no dawn chorus in Sorrento. I found the lack if song birds really strange. There were plenty of pigeons and a few gulls. There were plenty of crickets the loudest ones ive ever heard on Capri . There are many lemon groves in this part of Italy. 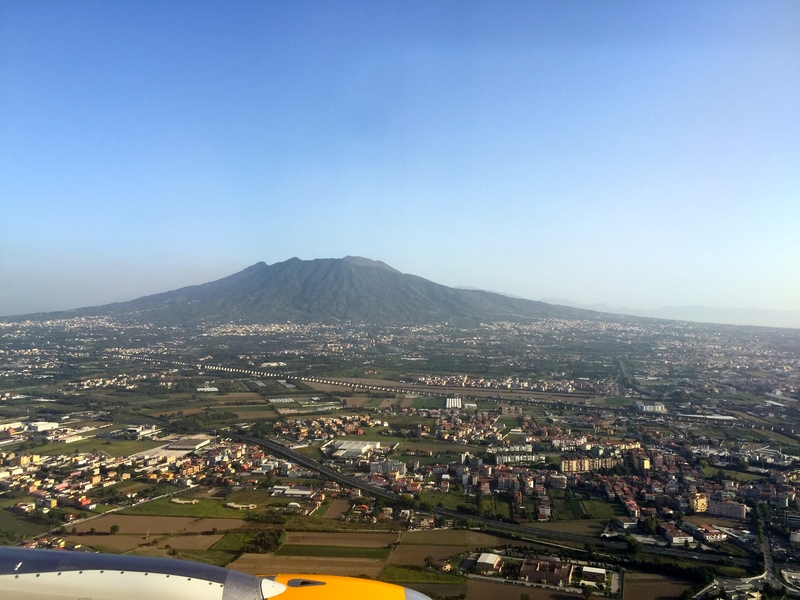 I have never seen such large lemons and the region around Sorrento is famous for its Limoncello liquor which is basically 30% alcohol with lemon. Watch out for little bitey buggers! Never actually saw what bit me but ended up with several nasty red lumps . One thing i absolutely hate about Italy and a lot of medditeranean countries is their horrid smelly toilets. No toilet seats! I mean whats that all about? God help you if you have bowel problems! They were fine in the hotels. 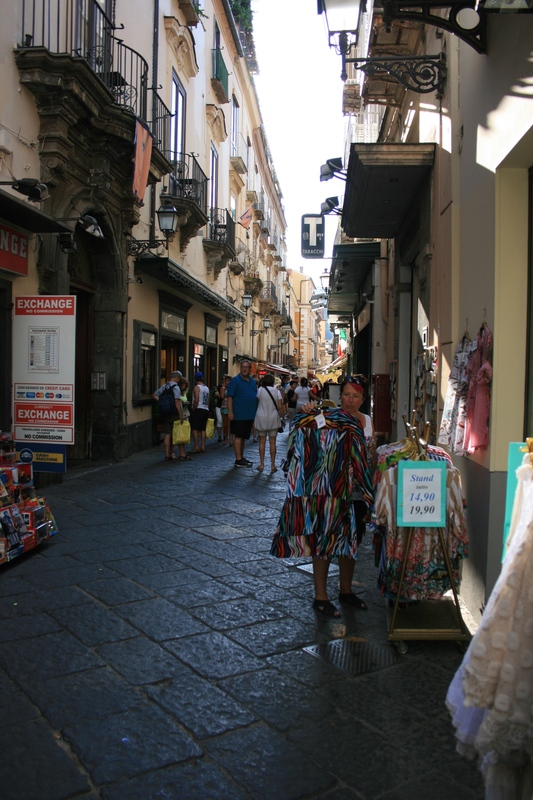 Sorrento is a busy unashamedly tourist town. 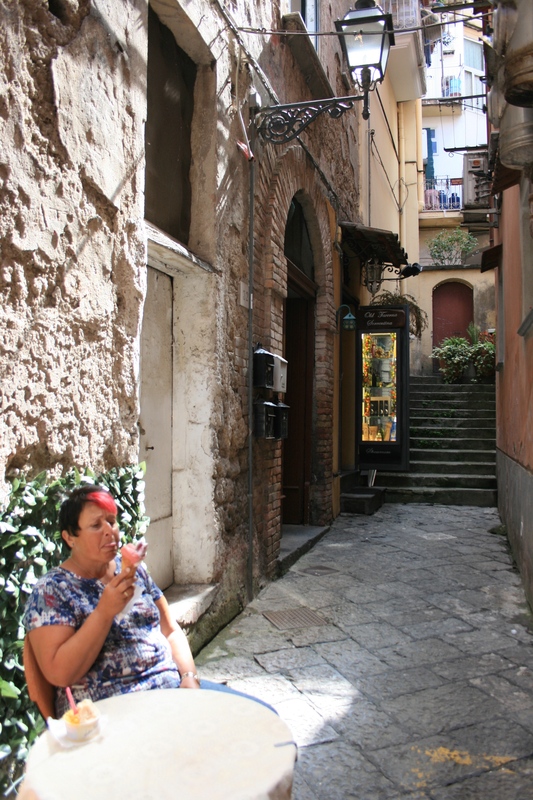 Lots of paces to eat inside and out and some gorgeous patisseries , with various coffees served just right as Italians should. The ice cream in the gelateries is to die for! Every flavour you could think of and more. I had an ice cream nearly every day. 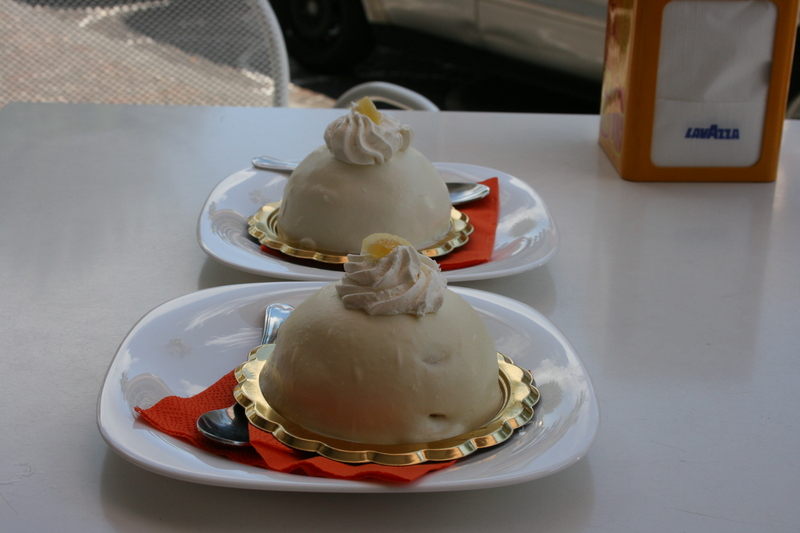 Italians make the best waiters without doubt – so attentive and efficient. The little tiny alleys that crisis cross off the main street can have you confused as they begin to look the same and you end up asking yourself if you’ve been there before. There are many souvenir shops selling products made from lemons and ceramics that are made in the area. there’s a lot of Italian linen garments in the shops and leather goods. Public transport in this area is very reliable and cheap. We took the train from Sorrento to Herculanium. it took about 50 minutes and cost 2.80 euros. the train was a bit rickety rackety with loads of graffiti.